So, what’s next? In April 2019, I’ll be leaving to hike the entire PCT AGAIN, only this time I won’t be hiking it alone. In 2018, I hiked the trail for myself. I started by myself, learned a lot about myself, grew as a person, faced all of my fears and met a lot of amazing people along the way. In 2019 I’ll be hiking the PCT for love, not only my love for the trail, but with my love. I’ll be hiking all the way from Mexico to Canada with my boyfriend, Bleeder. Some of you may remember Bleeder from my early days on trail in 2018. He was part of my Team Lagger trail family from Day Three, all the way until Day 56 when he had to go back home to Sweden. Bleeder and I walked together every single day for 266 miles before I had any clue he was romantically interested in me. Finding love on the PCT wasn’t on my radar apparently. During the two months I hiked with Bleeder on the PCT in 2018, we had hiked just shy of 700 miles together. We were inseparable. We shared countless laughs and meals. We endured lots physical and mental hardships together. I don’t know how many times I heard him say, “Goddamit Token!” We once hiked all night long until the sun rose and we were literally walking the trail in our sleep. He wiped tears off of my face multiple times. He was there on one of my hardest days on trail and helped me get through it. And even though his incredibly long legs made him a much faster hiker than me, he would still wait for me at least once an hour just so I could catch up to him. We made a lot of memories with one another during the two months we hiked together in 2018. After Bleeder got off trail and went back home, he started talking about coming back to finish his PCT hike. Along my own hike in 2018, there were certain sections I had to miss for various reasons – 150 miles of the desert from Tehachapi to Kennedy Meadows, Forester Pass, the chunk of Northern California from Shasta to the CA/OR border and all but 47 miles of Oregon. I knew at some point, I’d be coming back to hike the sections I had missed. Bleeder kept talking about how he wanted to hike the whole thing over again, especially the 700 miles we had already done together in the desert. 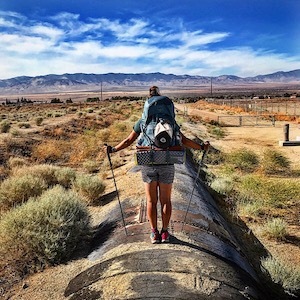 After a month of thinking about it and talking about it, we decided to do it – hike the entire PCT all over again, together, in 2019. I have to admit, once we decided we were both coming back in 2019 to hike the entire trail together, it made the rest of my 2018 hike a bit easier. As soon as I hiked up through Kearsarge Pass and entered the High Sierra by myself, I knew in my heart I wanted to come back and experience the entire section again with Bleeder. I wasn’t mad about missing certain parts of the trail because of trail closures and fire reroutes. I wasn’t devastated that I had to hike Goat Rocks in the fog. I wasn’t even upset about Section J, the section of the PCT from Snoqualmie Pass to Stevens Pass (and arguably the most beautiful and scenic part of the entire trail) being covered in thick fog and heavy rain the entire time we hiked through the area. I knew I’d have a second chance to see all of these places again because I’d be coming back the next year to hike it with Bleeder. Some people think I’m crazy to want to hike the PCT all over again. Some people wonder why I don’t go hike another long-distance trail and see something new. The thing is, I fell in love with the PCT and I fell in love while I was out there hiking it. I still have some unfinished business on the PCT and there’s no one else I’d rather finish it up with and experience it all over again with than my Bleeder. PCT Class of 2019, here we come! Kathleen, that is great to hear about you and Bleeder. I am glad you will be able to once again be able to fulfill your dreams. I’ve read many blogs of hikers doing the PCT more than once. Some choose to go both directions. I just hope I’ll be able to do it once. I just hope there will still be unturned forests to walk through by the time I do the hike in 2023. I hope you will continue to log your next hike. You are a very good writer and I am looking forward to following your next adventure. Perhaps you will post more video as well. Thank you for the kind words! I will be blogging and sharing my PCT 2019 hike with all my followers, especially through my Patreon page. Click here for more information about Patreon. There’s definitely more video in the works for the near future. For now, I’ve been working on creating a YouTube channel. Click here to check out my Hungry Hiker videos on YouTube. Be sure to Subscribe to my channel and Like my videos. I have all kinds of new and fun things I’ve been working on behind-the-scenes. Stay tuned for more. Join my VIP mailing list to be the first to know of all these exciting things as I launch them.